As I finish up this post the weather outside my building is a balmy 60 degrees and the afternoon sky cant decide if it feels like giving us a beautiful sunset or one more downpour to finish out the day. Odd winter weather this year indeed. We have had our fair share of fridged days, however, which has us yearning for one thing – soup. Loved not only for its warmth and comforting capabilities, a pot of soup is usually a simple marriage of ingredients taking no longer than 20 minutes tops to assemble. This spicy spinach soup is no different – easy and delicious. Bonus – it’s also healthy. In fact, perhaps you’ll notice after glancing at the the following list of ingredients but there was no badness invited to this party – no heavy cream, cheese, or bacon. A clean, simple soup. Add a little kick with red pepper flakes and a hit of siracha (like I do!) if you dare. Begin by sweating the onions in a T of oil in a large pot. After about 5 minutes add the sliced garlic. 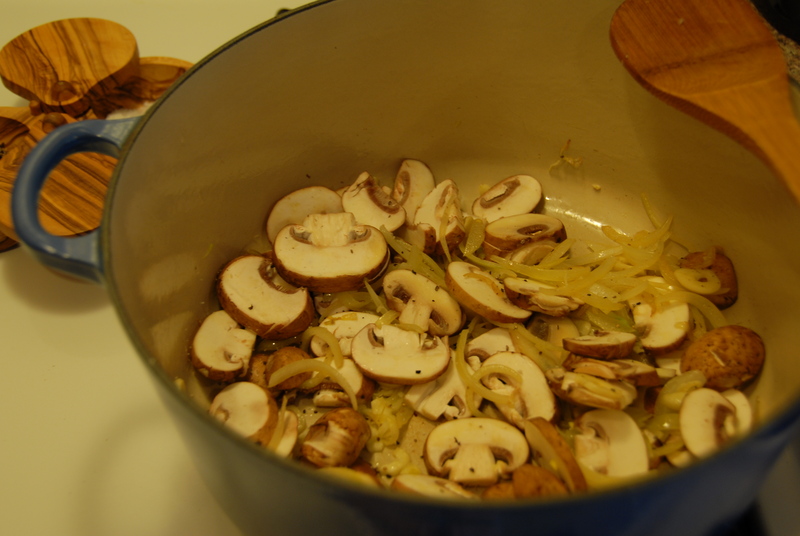 Once it’s become fragrant add in the mushrooms. Cook until the mushrooms are soft. Next add in the broth, spinach, green onions, red pepper flakes, season with S &P and cover. Simmer for 15-20 minutes. Add in the juice of one lemon and adjust seasoning to your liking. I like to add a grain upon reheating. I’ve already eaten a bowl with a cup of whole wheat israeli cous cous, you could also use pasta or wild rice – whatever you fancy! Top with lemon zest and siracha…dig in. Healthy, delicious, spicy, fresh and lemony – it’s got it all! This entry was posted in Mushrooms, Spinach and tagged garlic, healthy, mushroom, onion, red pepper flakes, siracha, spinach. Bookmark the permalink.